Olga Vyacheslavovna Babak was born on January 9, 1986, in Kharkiv. In 2003 she graduated from Kharkiv Art Lycée and in 2009 – from Kharkiv State Academy of Design and Arts. 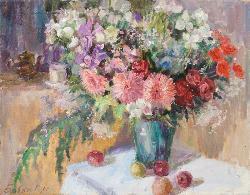 The painter is a member of Youth Department of National Artists’ Union of Ukraine. (The organization is situated in Kharkiv).